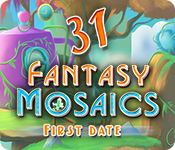 Fantasy Mosaics 31: First Date is rated 4.1 out of 5 by 14. Rated 5 out of 5 by StarWoors from LOVE THIS SERIES!!! This game is GREAT... Fairly NEW to Fantasy Mosaics but loving it all the same... Just HATE the music in this installment... But I LOVE this game series!!! Keep them coming!!! Rated 5 out of 5 by 88yrsyoung from keep them comming I have played these from the beginning. still love everything about them. still challenging and habit forming. they continue to keep my old brain staying young. Keep it just as it is. Rated 5 out of 5 by DRAGONWYN from Keep'em coming.. Buying them since #1, No time to stop now. Didn't bother with the trial hour, just bought it. Never a waste of a game credit. Rated 5 out of 5 by arnold1049 from ANOTHER GREAT GAME IN A GREAT SERIES This game follows in the tradition of all the other games in the Fantasy Mosaics series. The graphics are beautiful and the game play is challenging and relaxing at the same time. I have purchased every game in the series and will continue to purchase each one as it is released. I highly recommend this game and series. Rated 5 out of 5 by biscuitsmama from FANTASY MOSAICS 31 OFFERS A COLORFUL TIME WITH HARRY AND PENNY ON THEIR FIRST DATE Whenever I see a new Fantasy Mosaics I am always happy, particularly on a bonus punch day since I can use one of those bonus punches I accumulate for free games. 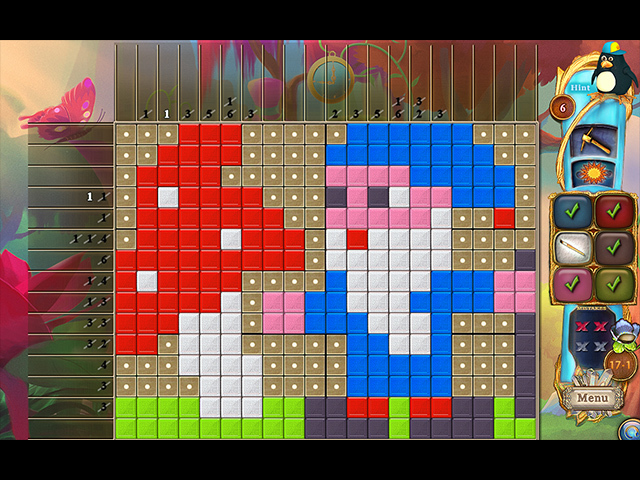 I know that all of the Fantasy Mosaic games are much the same BUT the colors are wonderful and the grids are large. Although there are some other mosaic games that are excellent (and I grab then when they are offered) I still love the little penguin family. I haven’t had a chance to go through all of the boards, but as far as I can tell the power–ups are the same; offering the hammer and the sun. That being said, the thing I most appreciate is that the individual squares are clear and large enough for me to see without having to squint and try to determine where an available square might be located. 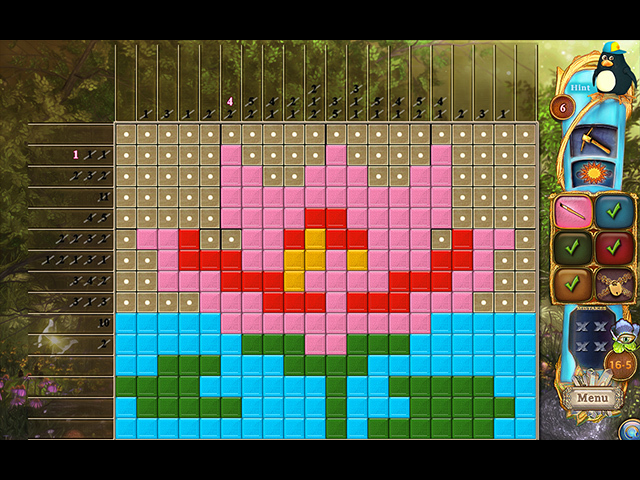 It might not be a big deal for some younger players but once we hit a certain age, our vision might not be as clear and it is totally appreciated by this reviewer that the squares are a bit larger. Something else to enjoy with this game is that it doesn't begin with a simple board. 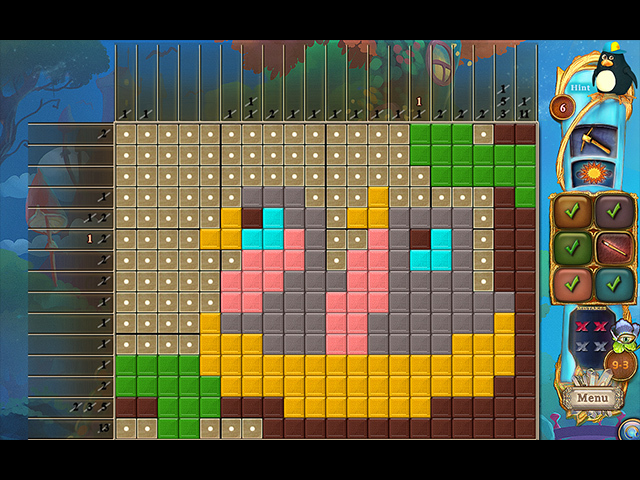 I had to put on my thinking cap when trying to place those early tiles. For me Fantasy Mosaics 31: First Date is a wonderful Monday morning surprise. I’m having a great time going on this first date with Harry and Penny as they romp through the various screens. Although the game was an instant buy for me, please try the demo to see if this is a game you will enjoy. Happy gaming! Rated 5 out of 5 by catalano from griddler guru Finally another puzzle. Took too long. Best part of the game is the colors. Easy to just get in the zone and relax and play. Rated 4 out of 5 by BearCreekStables from You can go to Options and unlock the colors I do like playing these games but yes I do wish a change would be done. I haven't used a hint since game #5 much less a sun or axe but today I actually used the axe. I was hoping that meant the games were getting harder but no that was not the case. I do think the Garden part is better as the items actually seem to fit the theme better. The colors seem to be better as well. Also for those who didn't know go to Options and you can unlock the colors. I see several voiced complaints about not being able to start with all colors. I used a coupon for the game which is the only way I would have purchased. Rated 3 out of 5 by abarrett from Same as it ever was. According to Henry, "I and Penny" were off on a date? Other than that introduction, there wasn't anything new since the introduction of the secret colors and choosing the appearance of the grid squares. It's not a terrible game, just the same gameplay and very little story. I would recommend it to those who love this series or like this type of puzzle game. I may buy this in a BOGO sale if I need a second game or need to use a coupon.